One of the things I really appreciate about Sophie’s designs are that she knows the usefulness of scraps. 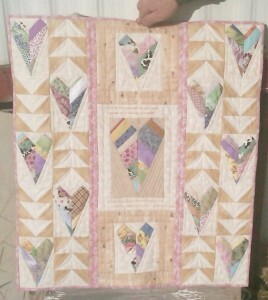 Here is a little quilt I made from the trimmings from this month’s string hearts. The triangle squares are leftovers from another project, too. It makes me think of the conversation candy hearts that are out for Valentine’s day. I LOVE this little quilt! That was a wonderful use of scraps and leftovers. This is so sweet. I haven’t even started my hearts yet. This inspires me to get going so I have some left overs too. This little quilt is adorable, Kathleen! I love the hearts with the flying geese. Great job!